What will Ethan do? He needs a monster under his bed. Substitute monsters appear but none are as perfect as Gabe. Herbert's teeth aren't sharp enough, Mack's slobbering induces giggles, Cynthia's tail isn't scary at all, and Ralph has nail polish on his claws! This will never work! How will Ethan ever get to sleep without his monster? 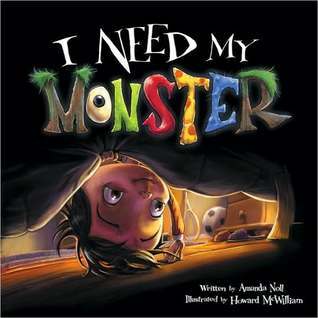 I Need My Monster is a unique monster-under-the-bed story for all monster-loving kids. The perfect balance of giggles and shivers will keep you under your covers, and you'll soon be sleeping soundly. Ethan can't sleep without his monster, Gabe. A parade of substitute monsters tries to take Gabe's place, but none of them are quite good enough. What is Ethan supposed to do? I Need My Monster is one of the cutest kid books I have ever read! I loved that Ethan actually wanted to have a monster under his bed. This would be a great book for kids who (like me when I was younger) are total scaredy cats and think that there are big bad monsters hiding in the dark corners of their bedrooms. McWilliam's illustrations really make the book, bringing to life the various monsters that try to take Gabe's place while he is on vacation.